The stem is flat and erect with roots at its nodes. The leaves are linear with a broad round base narrowing at the tip. The flower head is reddish, purplish, pinkish or greenish. The seed head is windmill-shaped and the seeds are short with stiff awns. The plant can grow up to 2 m tall. It completes its development in 42-64 days. Each plant can produce up to 40,000 seeds. The young weeds resemble rice seedlings and they are often transplanted by mistake. The stem is reddish-purple or green with a reddish base. The leaves are linear with the basal often giving off a red coloration. The flowers are green to purple and are found throughout the year. Each plant can produce up to 42,000 seeds. Like the other species, the seedling looks like rice seedling and are often transplanted by mistake. As the name implies, the seeds are without awns (Rice IPM, 2001). Studies show that a single barnyard grass per square foot can reduce rice yields by about 25%, and 25 barnyard grasses per square meter can cause about 50% yield loss. The mature plant grows higher than rice, so that it competes for sunlight, besides soil nutrients. It is also an alternate host for tungro and rice yellow dwarf viruses. Barnyard grass can reduce corn yields by 20%. It is an alternate host for corn's pests. Barnyard grass is used as fodder for livestock, young leaves are used as vegetables, and the seeds are used as human food. 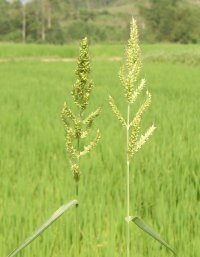 Research indicates that Barnyard grass is found to be resistant to Butachlor and Propanil onsome rice fields in Sri Lanka and Thailand (Weed Science, 2005). Junglerice is found to be resistant to Propanil on some rice fields in Colombia, Costa Rica, El Salvador, Guatemala, Honduras, Nicaragua, Panama, and Venezuela (Weed Science, 2005). Thorough seedbed preparation to prevent the weeds from growing on the seedbed. Remember that the weeds look like rice seedlings and are always transplanted by mistake. For rice, it is better not to practice direct seeding. Transplanted seedlings are more competitive than directly sowed ones. Duong Van Chin (2001): Biology and management of barnyardgrass, red sprangletop, and weedy rice. Weed Biology and Management, Vo 1, Issue 1, p. 37. Moody, K.; Munroe, C.; Lubigan, R.; Paller , E. (1984): Major weeds of the Philippines. University of the Philippines, Los Baños. Laguna, Philippines.